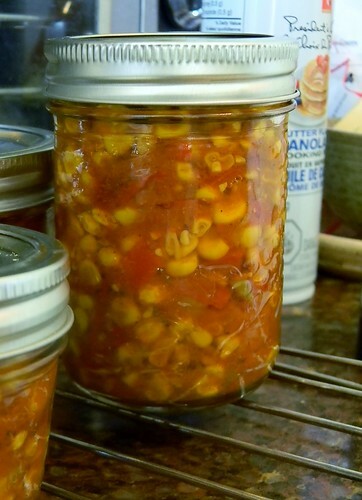 Fiesta Relish | What Smells So Good? Well, it's definitely not Summer any more around here. After a few weeks on morning playground duty (all the while wishing I could be in my car with the heater on full blast) I finally broke down and bought snowpants - snowpants! - as well as leggings to ward against the chill. The kids don't feel it, running around as they are, but I'm not alone in asking "is it Summer yet?". Well, it may not be bright and balmy outdoors anymore, but inside my pantry has a plethora of canned sunshine. I took advantage of the (inexpensive) bounty of fresh, local corn available minutes from my door this year and blanched it before packing most of it up in freezer bags. A couple ears left over from the school corn roast (that didn't go into the salsa) I took immediate action on, though, roasting them to bring out even more of the natural sugars in the kernels and add a delicate smokiness to whatever they played with, especially the tomatoes and peppers I still had growing at the time. A few spices and a trip through the waterbath canner later, I had a slightly spicy, tangy-sweet relish put up for days like today - where a spoonful can really be the only source of heat at hand! Place all the ingredients into a deep pot and bring to a boil over high heat. Reduce heat and cook, uncovered, for 25 minutes, stirring frequently. 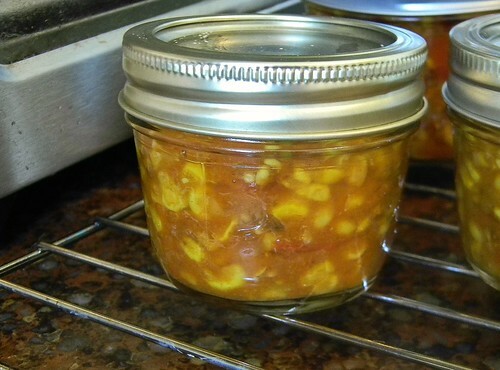 Spoon into jars and process 15 minutes in a waterbath.